Just a quick simple one this…! The library items have their lines misplaced, items are still selectable, you might have to be a little careful with the bottom scroll bar. the main settings menu has the lines of text truncated at the top and bottom, you can however just about make out what they say and they select fine. Despite all this, I’m keeping it! 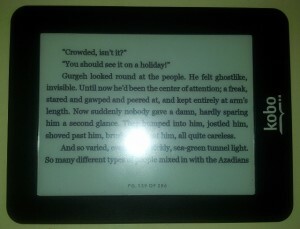 I can live with these problems being as the reading experience is that bit more comfortable. The page width is now the same width as a paperback and for me the width of the page is more important than the height, its very much a case of personal taste so this might or might not be for you! Hi. I’d love to try this, but I don’t know how to get at the file. I’m browsing the files via the standard USB connection but can’t follow your given path. I’ve also been looking in the conf files, but I guess I’m in the wrong place. Can you help?